J-Punch and Dave Moonshine was created by former veteran underground DJ, Justin (J-Punch) of Washington, D.C. and his co-writer, Dave Moonshine from Los Angeles. Even though the two artists do not reside in the same city, the distance does not take away from their creativity. Justin and Dave write and create music year round, but meet once a year to collaborate their ideas and record the final cuts for their music. In September 2011, the duo will be working on their upcoming new EP that is expected to be released in late 2011. A year ago, J-Punch and the Moonshine debut their first CD called, Stick Figure Guy. The CD is full of smooth House and Ambient elements mixed with a sort of Alt-pop and Alternative rock. Their unique sound is just what it is. Music from Stick Figure is so unique it is difficult to compare them with anyone else in the industry, but they do have a familiar sound. More importantly, it’s both likable and addicting. If I had to compare J-Punch and Dave Moonshine with someone else in the industry, it would have to be The Cure, Depeche Mode, Howard Jones, and 6 Feet Underground. Throw them all in a tall wooden bucket and churned them into a soft butter and mix it with some Enigma (without the Gregorian chants). 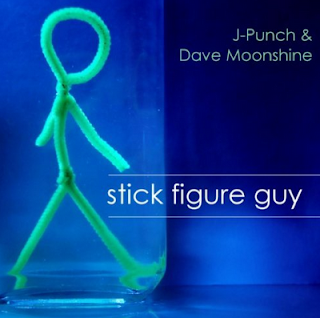 If you like the sounds of the 80s and you enjoy house, you’ll love J-Punch and Dave Moonshine. Music showcased in this episode: “Hours Late”, “Shoes”, “Almost Over”, and “We had It All (Now, it’s all fucked up)”.